Attract native birds with the perfect nestbox! 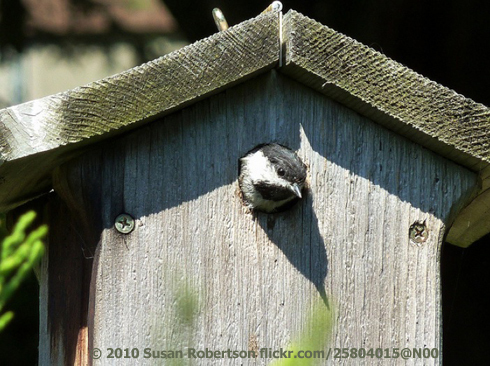 Many native cavity-nesters - including this Black-capped Chickadee - will nest in a manmade birdhouse, or nestbox. Look for a nestbox that's plain wood. If the birdhouse comes with a perch, remove it. It just makes it easier for a predator bird to land and go after the eggs or young. Here's the important part: the entrance hole should be 1-1/8 inches. No more, no less, exactly 1-1/8 inches. That size will let native birds in, and keep non-natives out. Now hang the nestbox out of the way of predators. You can buy a nestbox - or build your own! We’re hearing native birds: a House Wren [House Wren song], a Black-capped Chickadee [Black-capped Chickadee song], and Red-breasted Nuthatch [Red-breasted Nuthatch call]. One of these birds might make its home in your yard, if you put up the right kind of birdhouse. They’re all “cavity-nesters,” birds that need a cavity in a tree—or a birdhouse that serves the same purpose—for nesting. Look for a nestbox that’s plain wood, none of that fancy stuff. Birds prefer their nest sites to be inconspicuous. If the birdhouse comes with a cute little dowel perch, remove it. The nesting birds don’t need the perch. And it just makes it easier for a predator bird to land and go after the eggs or young. Here’s the important part: grab a ruler and measure the entrance hole. It should be 1-1/8 inches. No more, no less, exactly one and one-eighth inches. If the entrance hole is too big, use an adapter to reduce the size. That size will let native birds in, and keep non-natives out. Now hang the box where it’s out of reach of any predator. We’ll help you find nestboxes just right for the birds you’d like to attract. Or plans for you do-it-yourselfers. Come to our website, BirdNote.org. Come soon, it’s time to put them up. I’m Michael Stein. Calls and songs of the birds provided by The Macaulay Library of Natural Sounds at the Cornell Lab of Ornithology, Ithaca, New York. Black-capped Chickadee song, House Wren and Red-breasted Nuthatch call recorded by G.A. Keller.